Summary: Make sure you are prepared to answer any question a law firm might throw at you by reading through this comprehensive list of questions and answers. When you are interviewing with a law firm, you always need to be prepared to answer any question they throw at you. Here are some of the most common law firm interview questions. 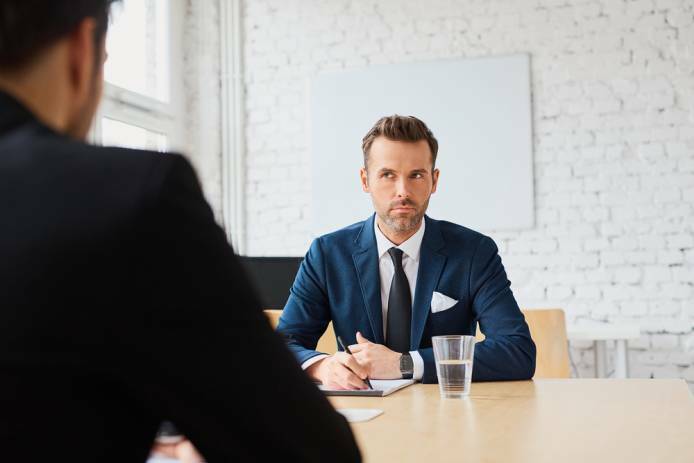 Many of these questions overlap in certain aspects, but the key to acing your law firm interview is to be ready to answer each of these questions in a clear, concise, and specific manner. We recommend thinking through these questions very carefully. We also note that some people benefit from physically writing out the answers and even practicing speaking them out loud. The goal is not to memorize answers, but rather to become so conversant with the questions you might be asked and the answers you will give that nothing rattles you during the interview and the answers roll effortlessly off your tongue. Self-Descriptive Questions: These are open-ended questions that ask you to give a description or characterization of yourself. The interviewer is interested in the substance of what you say (what kind of person you are), but the interviewer also is interested in how and why you give the answer you give. Successful answers will be short, simple, and articulate. They also will demonstrate a sophistication and appropriateness of judgment as to why you chose a particular characteristic, trait, or experience to discuss over all others. How would your friends/co-workers describe you? What experiences most influenced your career choice? What constitutes success in your mind? Do you see yourself as a litigator or transactional lawyer? Why? What do I need to know about you that’s not on your resume? Questions about Your Strengths, Weaknesses, and Professional Attributes: These questions are designed to illuminate your strengths and weaknesses, which are obviously relevant to an employer. When it comes to strengths, you should be honest and confident but not boastful or arrogant. The law firm is looking to fill a position that requires certain skills and you want the law firm to know without hesitation that you are more than capable of performing those very skills. Why would a law firm hire a litigator who is not fully confident in his or her writing ability, for example? When it comes to weaknesses, you should be forthright – but be mindful that you can almost always “spin” a “weakness” into a “positive” by demonstrating a willingness to acknowledge that weakness, to work hard to overcome it, and to figure out a way to move past it or to use it to your advantage. What’s the biggest mistake you’ve ever made? How do you get the best out of people? How do you go about handling difficult people? How would you go about building a trusting relationship with a client? How strong are your writing skills? What sort of management skills do you have? Would make you a good trial advocate? Questions about Your Career Path and Goals: These questions can reach as far back as your initial desire to pursue law and include anything along your career path up until now – high school, college, law school, past jobs, and past professions. The interviewer wants to see a logical progression to your career arc, so he or she feels confident that you have the mindset and experience necessary to do the job at hand and be part of the legal profession. The interviewer also wants to see that you are a “goals minded” person with an overarching career plan for the rest of your professional life. Lawyers with plans and goals are considered assets to law firms, as opposed to people who appear to aimlessly drift through life and jobs without the benefit of a structured and reasoned plan. Why did you choose law? Why did you go to law school? Have your goals changed since then? How has your education and experience prepared you for the practice of law? Why did you choose to work at these specific organizations on your resume? What did you particularly like/dislike about that work? Why did you leave your prior jobs? What did you do between college and law school? Why did you decide to switch from your previous field to law? What are your short/long term career goals? How are you planning to achieve these goals? Where do you see yourself in 5 (or 10) years? In what ways do you see yourself needing further development in order for you to be fully effective in your career? How to Explain ”Job Hopping”. Simplifying the Complications in Your Story. Questions about Your Job Qualifications and Suitability for the Position: These questions are designed to assess whether you are qualified for the particular position being offered and whether you are suitable for the law firm offering it. Your answers should demonstrate that you understand the nature of the job, can do the work, are interested in the relevant area of law, and actually want to do the job as opposed to just taking the job because it is available. Your answers should show the interviewer that you have researched the firm and have a good basis for wanting to be at that firm – whether it is because the firm has a great reputation in the field, attracts the best clients and most sophisticated work, is located near your hometown where you are returning to settle, or for another rational reason. You want your interviewer to understand that – due to your experience, background, expertise, personal plans, and commitment – there is simply no better candidate for the position and firm. What kinds of things give you the most satisfaction in your work? Why do you want to work at our office? Why do you want to work in our office, as opposed to other offices that do similar work? What do you like most about this firm/practice group/organization? Which of our legal practice areas and/or areas of interest are you most interested in? Why are you looking at this area of specialization? How did you become interested in X practice area/subject matter? How much experience have you had in your field of interest? What fields interest you other than the one you are in? Why our practice setting? Why our issues? What is your geographical preference? What ties do you have to our area? What qualifications do you have that will make you successful at this job? Why should we select you over all the other candidates? What would you look forward to most in this job? What would the greatest drawback of this job be for you? What do you think will be the hardest part of this job for you? What kind of training or supervision are you looking for in a job? What criteria are you using to evaluate the employer for which you hope to work? What is your ultimate career goal? How does this job fit into those goals? Why did you come to us through an agency? What are you expecting from this firm in the future? What sort of salary are you expecting? If offered the position, how long do you plan to stay at this company? What challenges are you looking for in this position? How do you feel about long working hours? What other law firms have you applied to, and why? Why did you decide to switch from private sector to public interest work? How much experience have you had with public interest organizations? What’s the Best Way to Convince a Firm That I Am Serious about My Geographic Move? Questions about Your Personality, Values, and Views on Law: These questions are designed to assess your personality, values, and views on the law to ensure that you are a good fit for a law firm environment and for the unique law firm environment where you are interviewing. Some of the questions are designed to assess whether you are a team player (important for a law firm). Others are designed to assess your politics, awareness of current events, and the quality of your “lawyering” skills, such as analytical thinking, powers of debate, advocacy, and commitment to a cause. What qualities do you think a good lawyer should have? What two or three things are most important to you in a job? Are you a team player or do you prefer to work on your own? Do you like working by yourself? What type of people do you work with best or would have trouble working with? How are you prepared to work with clients/colleagues who are different from you? How to you deal with stress? Describe how you would handle a disagreement between you and your supervisor about the direction a case should take. What do you feel are things that help a person become successful? How do you feel about accountability versus reconciliation? How do you feel about representing alleged child abusers? Is there any crime you would have trouble defending? How do you feel when defense of the First Amendment conflicts with other rights? If you weren’t in law school, what would you be doing? Tell me about a recent Supreme Court case you disagreed with and why. If you were a court, how would you rule on the following issue…? How committed are you to service for the underrepresented? What interest do you have in service to the public generally? What was an interesting legal issue you dealt with in your job last summer? If you had a completely free choice, which law would you like to change and why? In your view, what are the major problems/opportunities facing the legal industry? Why don't you want to be a counselor at law? Questions about Your Specific Accomplishments: If you have made it this far, you have accomplished a great deal! These questions are designed to showcase those accomplishments. The key to answering these questions is to be specific (give concrete details), be proud without being arrogant, and be honest. You want your interviewer to feel that he or she has learned something new, real, and exceptional about you. You also want your interviewer to understand that there is “meat on the bones” of your resume and that you will accomplish great things for your new law firm just as you have done for your past firms, schools, and in other areas of your life. You want your interviewer to be impressed with you, to consider you a “winner,” and to appreciate the value you will bring to the team. What one thing have you done that you’re proudest of? What is the most difficult/rewarding thing you’ve ever accomplished? What type of responsibilities have you had in prior work experiences? Tell me about your legal writing sample/note. Tell me about a legal memo you wrote this year. Tell me about a complex legal issue you worked on. Describe a situation where you had to convince someone of your viewpoint. Describe the project or situation that best demonstrated your analytical skills. What has been the greatest challenge you have faced during your volunteer efforts? How did you overcome such a challenge? Describe a professional failure and how you handled it. What community service project do you believe allowed you to make the greatest impact and how? Questions about Your Law School Experience: Especially for recent law school graduates, there will generally be a set of questions about law school and the law school experience. Until you have practiced for several years, there is not much to evaluate you by except law school. Moreover, law school is something all lawyers have in common and it is thus a relatively easy place to focus on in an interview. Thinking through the following questions will prepare you to tackle the majority of questions about the “law school experience” in an insightful and productive manner. Remember, you are applying for a job as a lawyer, so the more enthusiasm you manifest for law school and all it had to offer, the better off you will be. What do/did you like most about law school? What do/did you find most challenging? What was your favorite class in law school? Why? Who was your favorite professor in law school? Why? Tell me about your hardest law school exam question. What extracurricular activities have you participated in during law school? What was the issue you argued in Moot Court? What was the argument on the other side? What clinical work have you done in law school? Tell me about your participation on the journal, in your externship, your clinical program, or your research project. Tell me about your thesis/journal article. Do you think your grades are a good indication of your academic achievement? Are they an indication of your ability to do a good job at this organization? Have you enjoyed law school? How Much Do Grades Really Matter for Attorneys? Questions about Outside Interests and Hobbies: You should always be prepared to answer questions about your outside interests and hobbies. Sometimes these questions come up as icebreakers and sometimes they are used to assess whether a candidate is a well-rounded person with interests outside of work. But beware – while on one hand law firms want to hire people who have balance and texture in their lives, on the other (and often more important) hand, law firms want to hire people who will do the work that is asked of them, assimilate into the law firm culture, and for the most part leave their outside interests and hobbies at the door. The way to handle these questions is to show that you are a nuanced and interesting person, but also that you have your priorities straight so nothing will interfere with your ability to be a team player and an extremely productive worker for the firm. What is the latest non-legal book you’ve read? What is something interesting that’s not on your resume? Tell me about your interest in rock climbing, course on Islamic law, etc. Would your social life infringe on your work commitment? Why Attorneys Should Brainstorm about Things They Like to Do Outside of Work.